It is a eye opener.It is awell compared and well compiled statement.thank you. are u saying that i can post in chinese via blogspot without knowing how to write it? A very detailed and effective comparison. The reason Blogger is preferred by developers is because of the level of customization it allows. I am also a developer, a novice though. But I prefer WordPress to blogger any day. Elegance sometimes has to be accepted. 🙂 Nice post. This was a post I was waiting for! I am stunned to see these stats. I knew this ofcourse as I got hardly any hits while I was in blogger but got better readership in wp. But these stats are telling. The page rank is a mystery, but then I think page rank depends on many things, but need to study that aspect. The difference in stats is startling. Bloggers have more options in designing the look of your blog but its a tiring process to put comments there. This was one great "vs" post! @Faheem: Thanks Faheem. I learnt a lot while writing this post. I was clicking all the icons of the wordpress composer when I found an extra row of buttons appearing there. Useful features like Justify are there! @Radha: I can post in Tamil or Hindi only if I know the language. You can type the local language word on the editor in english (Like Sawaal ka jawab) and it will convert this into Hindi script. There is an option in Blogger where you could do this. You should be able to blog in Chinese too I guess, if you know the Chinese words. I think this is called transliteration. But need to check. @Anniyan: WordPress is more elegant. I should agree to that. But Blogger has some good features too. If I had decided to blog in either WordPress alone or Blogspot alone, maybe the stats of the respective site would be different and more. One blogger blogs in Rediffiland and gets about 25 comments from fellow Ilander's alone! Quality always matters. @Su: I guess a lot of people have moved. And stats may not matter at the end of the day. It surely encourages you to write more. @Nita: I think only you and Axinia knew about this beforehand! Even I don't understand the Page Rank concept. From the beginning my WordPress site was ranked higher. But both the sites have the same content. Maybe wordpress as a domain carries a higher ranking? But I really don't know. Some one who knows could share their views. But there are some very good Blogger sites, Nita. After Blogger introduced the Open ID commenting, I was thinking whether I should continue with wordpress alone as now the traffic is diverted, with both. But then I decided against it as wordpress was getting good stats anyway and I am not going to do anything with a lot of stats!! @Amit: I want to do one more 'vs' post, and will be out with it soon. It seems you can edit your CSS in blogger. Anybody has any idea on this? @Vishesh: You are right about the search results. WordPress gets a lot of this kind of traffic. Also we get traffic from the tags. WordPress manages these two very well. That is an important point you have raised. Is stats important at all? I can understand the importance of the comments as they give a powerful feedback of the posts and more comments mean more diverse views, and that helps. But is the stats in itself, as important as we bloggers (including me) think? Jokes apart, I should say this is a quite a post. * There are many 3rd party sidebar widgets for Blogger. * Recent comments: You could use the RSS feed hack on the sidebar. This is what I do. Blogger has a widget to show feed items. Use that to subscribe to your own comment feed on the sidebar. * With Blogger you could as well email your posts to publish. Also you could use the Blogger Data API to publish posts (in bulk usually) or to be used inside other client applications. I think WP supports other weblog clients via its XML-RPC APIs. auto-posting to blog aggregating services like Technorati, etc which Blogger doesn't. That could explain something about the popularity/ranking of WP blogs. One of the commenters have observed that Blogger does allow search engines crawlers. This is not entirely true in that there is an option in the Settings on Blogger dashboard which determines if the page is being crawled or not. This option is 'ON' by default – so Blogger does allow SE indexing. * This is a non-techie's comparison of two most popular free blogging tools. This is both its plus and minus. While it discusses features like aesthetics and ease of customisation, it doesn't consider other important aspects like security, privacy, integration into other systems, other publishing mechanisms (eg. publishing directly from Google Docs) and lot more. While it will satisfy non-tech folks, it will hardly impress the other camp. i too crave for stats sometimes. that is when only 4-6 visits occur on a (bad) day. otherwise i'm happy most of the times if comments make up for the stats. the feeling gets worse when i compare it with my friend's blog. I brought him to blogging, and his was a pretty unpopular blog till a couple of months back. but then, hits started to pour in suddenly and he was very happy. but later realised that even as the visits were high, the response was poor. Thanks for the detalied informative psot..I had always tried to know which one among the two is a better platform,for a simple user like me..In my experience,not as a blog owner,but as a visitor to other blogs,I find wordpress more easy to comment and has more readability..
@Kanagu: I think both have their plus and minus points. The third party widgets in blogger for example, could be directly applied from the site. 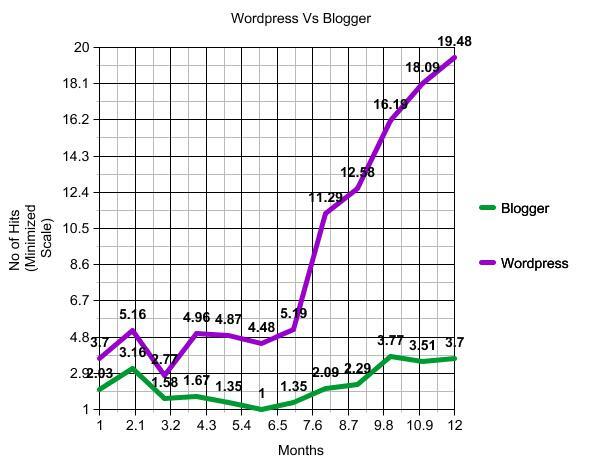 But if you strictly look at stats, WordPress is better. And I feel wordpress has a better community too. @Nimmy: Yes, even I find wordpress easy to comment, even from my cell phone. I find that wordpress users are more community oriented and networking well. But some of the debates, for me personally, happened in blogspot blogs. @Kiran: Thanks, I too liked the post you wrote on Malaysia. Why would I refuse the linking part, go ahead… I don't have a blogroll in this blog but will surely add it in my blogspot one when I update it next. Good comparison, DI. I've used only WP and love it! Blogspot certainly seems to be more customisable with plenty of widgets but WP is cool! People seem to shift from Blogger to WordPress quite easily but I haven't come across someone who has gone the other way. Not yet. I don't know why. @Raj: I think it is quite evident that the traffic is more for WP sites. But what I don't understand is, why is everyone obsessed about traffic (Including me!)? I understand, if some one wants more comments, but why more hits? Same posts in two places! I am planning to give this a try..sounds like a fabulous idea!! It is a good idea. Don't entirely go based on the stats. It seems Google doesn't like duplicate content and when I post simultaneously in WP and Blogger, it takes the Blogger page as a supplimental page (And hence the PR of NA till date for my blogger site!). Probably the lesser stats are because of this, which I came to know quite recently. This is to thank you, because had not realised the old blog stays even when you shift all your posts & comments to a new place! I just didn't, (and still don't) have the heart to abandon the first blog 🙁 This will make it easier to move to WP blog. DI, This was extremely informative! the statistics seems totally in favour or WP. Although I have heard a lot of people saying that WP is better in terms of hits – this is the first proper analysis I have seen – with both the content in both blogger and WP being the same. The traffic is more in WP because they manage Tags better and people reach your site through tags itself. I also think they do some content aggregation. And yes, WP has a great community and is community driven. It is a great option for non techie bloggers. Reached here through comments on CB’s blog. Very informative post. I see a lot of people moving to WordPress but did not know the reason. Now I know. I am fairly technical person but have difficulty making changes on Blogger. WordPress is very good for personal blogs. But if you want something professional (or) want to monetize your blog, then self-hosted WP and Blogger are better (respectively). I like wordpress more than blogger, wordpress feels a lot more clean. WordPress has a lot of features that make it look better, and easy to use. Just what the new blogger wants. But beyond that, its either self hosted WP or Blogger. I found this post as I looked for ways to cross post to a Blogger blog while migrating to a WordPress platform, and wanted to share my opinions, despite this being written some time ago. Wordpress is definitely the way to go, regardless of whether your blog is personal or professional, and the options are ENDLESS for customization, plugins, sliders, photo galleries, stores, etc. If you haven’t found a solution for you desired effect or appearance, you haven’t looked far enough – keep going, they’re out there. WordPress continues to grow by the day in functionality and available plug-ins, and now can easily be converted to a store. Many professional sites run on a WordPress content manager backend, including ours. Over 850,000 people have downloaded just the store cart we use alone! Blogger is a great launch setup for someone new to blogging looking to get some exposure on their platform, but anyone serious about making their blog a heavily used item should without a doubt be using WordPress. Feel free to email me any questions you may have, and check out WordPress’ multiple forums for ideas as well. guess u 4got about the no of languages supported in wordpress…it supports upto 60 languages.I havent used blogger.so not sure of languages supported by blogger.